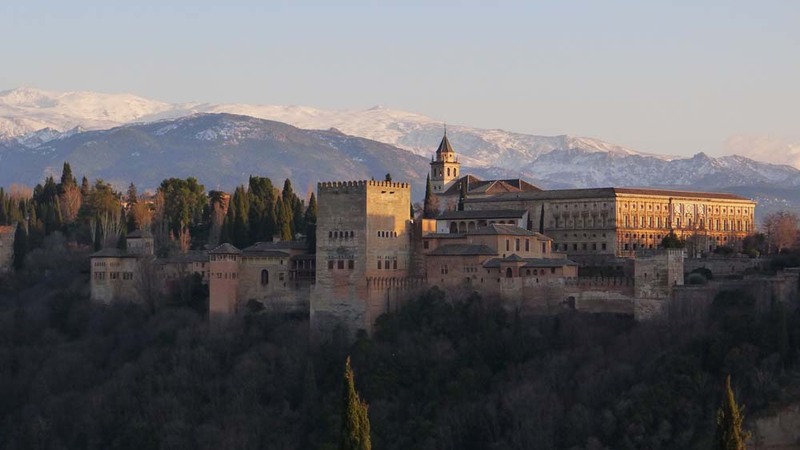 “… a rugged fortress without, a voluptuous palace within…poetry breathing throughout the fairy architecture of its halls…” Washington Irving, The Alhambra, 1832. 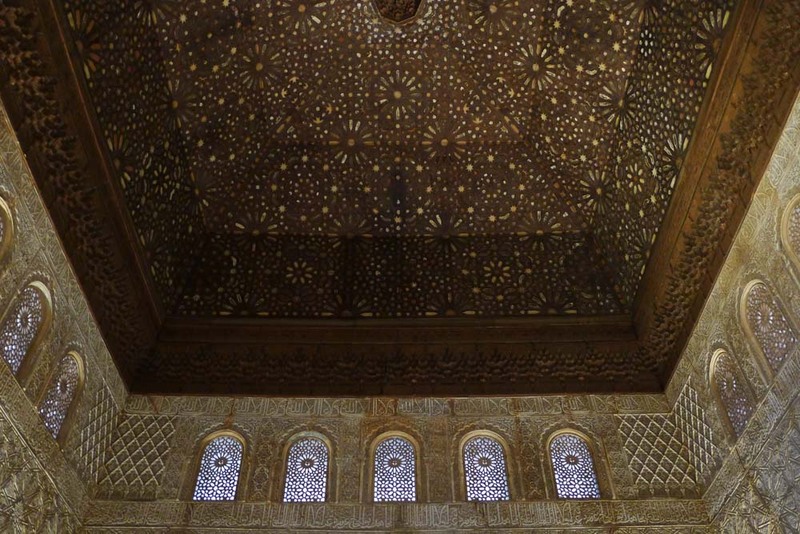 UNESCO WORLD HERITAGE SITE, THE ALHAMBRA (Al Qal’a al-Hambra, The Red Fort) GRANADA, SPAIN. 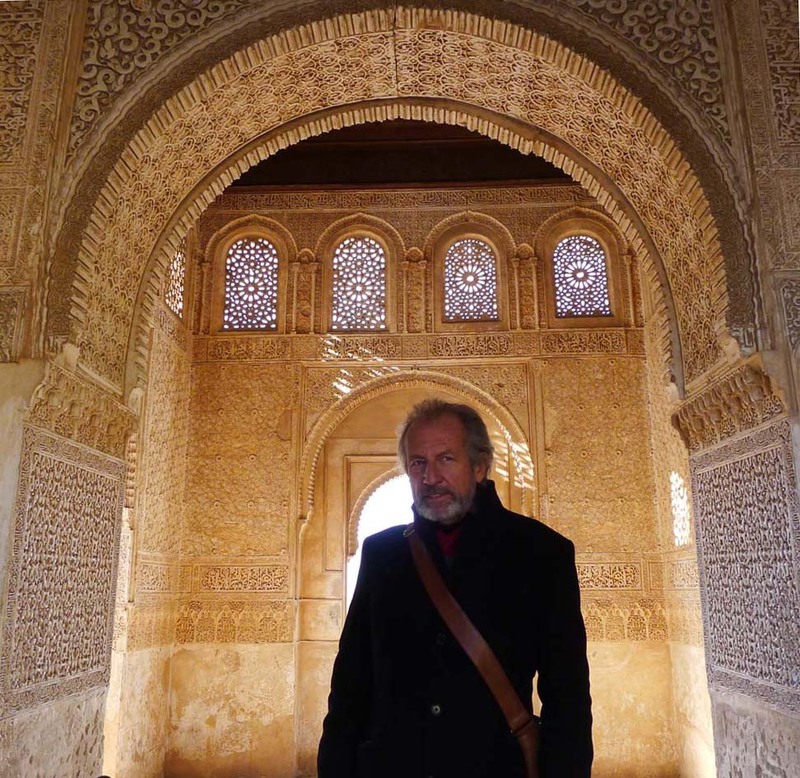 steered south, and 1800 miles later we reached the last Islamic kingdom in Spain. In the 6th and 7th centuries the Iberian peninsula was populated by Visigoth and Hispani tribes who couldn’t stop fighting each other long enough to fend off the Arabs and Berbers who sailed in from North Africa to seize Spanish real estate, and tax anyone who didn’t convert to Islam. 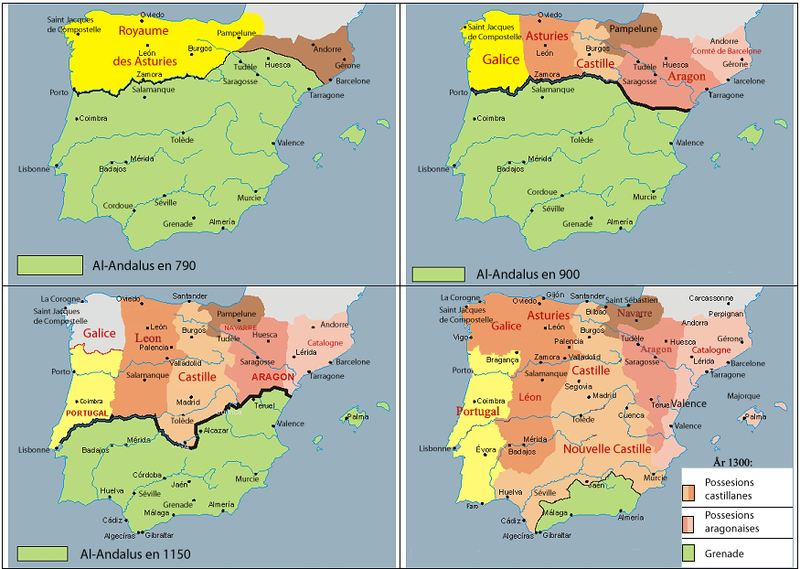 The green area shows (from top to bottom) the most territory the Moors ever conquered in Spain, to their last precious possession before their expulsion: the Emirate of Granada. 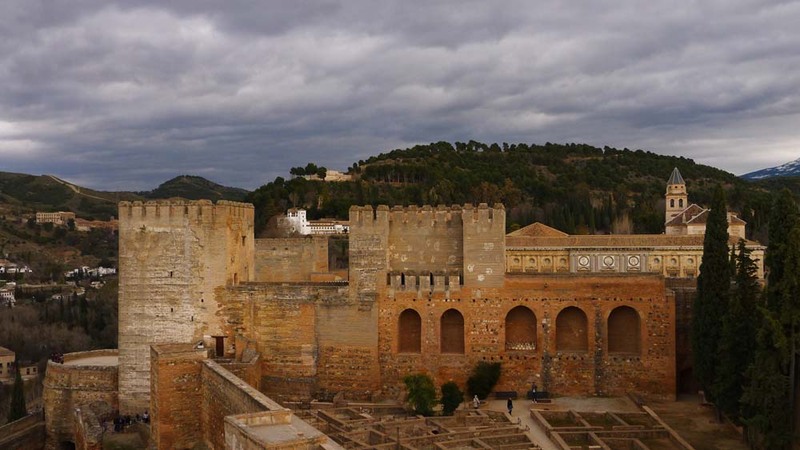 The ALCAZABA (the Citadel) 11th-13th centuries, was the military headquarters and is one of the oldest areas in the Alhambra complex. 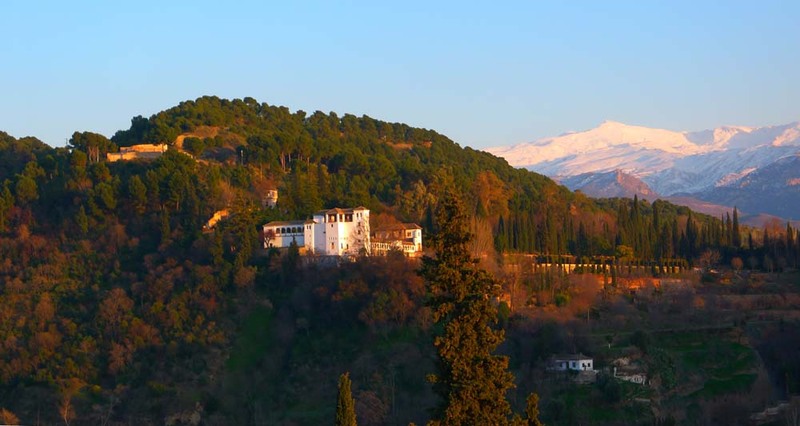 In the 1300’s, the Nasrid Dynasty (Moorish) conquered this mountaintop in Granada and built this impressive fortification that hangs dizzily over the cliffs. In time, they added ornate palaces with dreamy reflective pools and acres of sumptuous gardens. Before you die, you should visit this vast compound of heart-stopping beauty, but please follow my rules: allow two full days, wear chunky orthopedic shoes and remember that the only food allowed spews from the vending machines next door to the restrooms. Oh, and never, ever visit in summer, unless you are wearing a solar powered personal air conditioner around your neck. 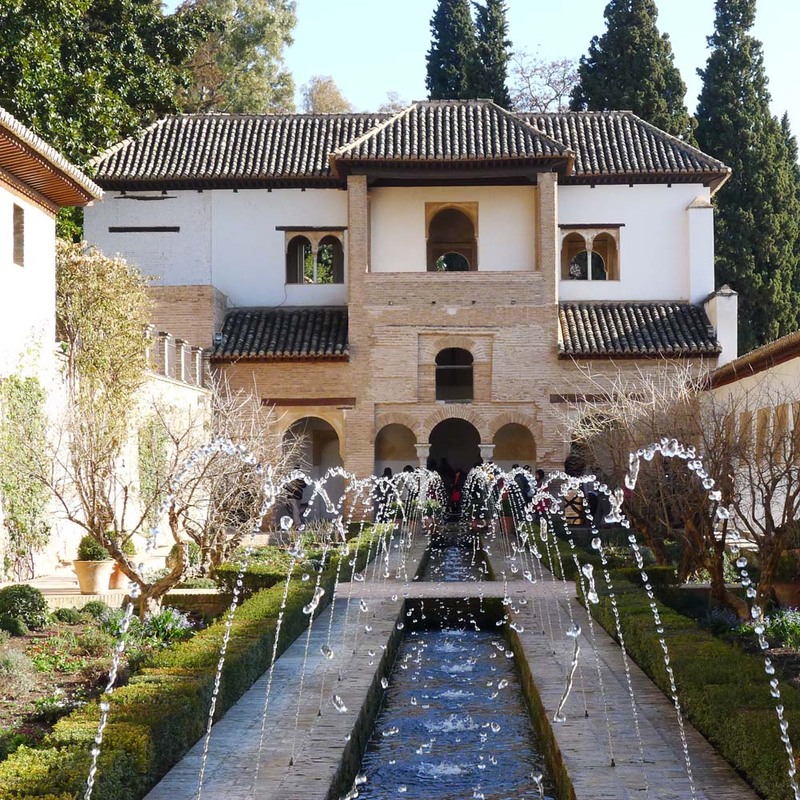 View of PALACIO DE GENERALIFE (in Arabic “Jennat al Arif”, Garden of the Architect). PATIO DE ACEQUIA (Patio of Irrigation). 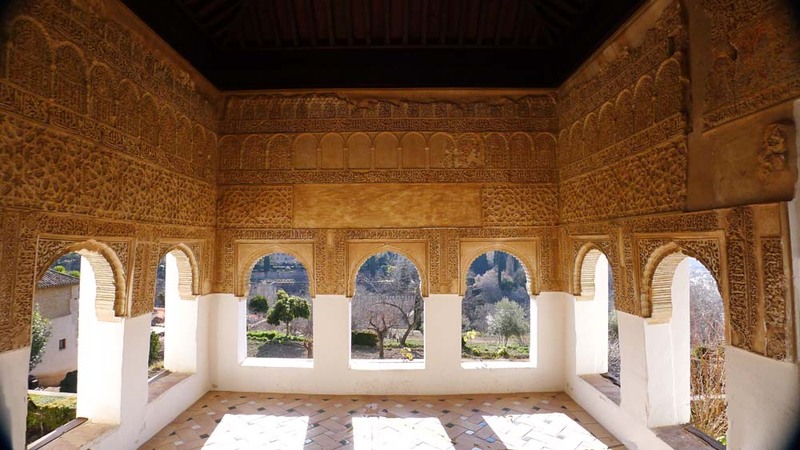 Indoor-outdoor living was invented here in a series of summer palaces built for the Moorish rulers and their harems. “Yet here is everything to delight a southern voluptuary: fruits, flowers, fragrance, green arbors and myrtle hedges, delicate air and gushing waters.” –Washington Irving. Which way to the harem? Water, in this arid climate, symbolized power. 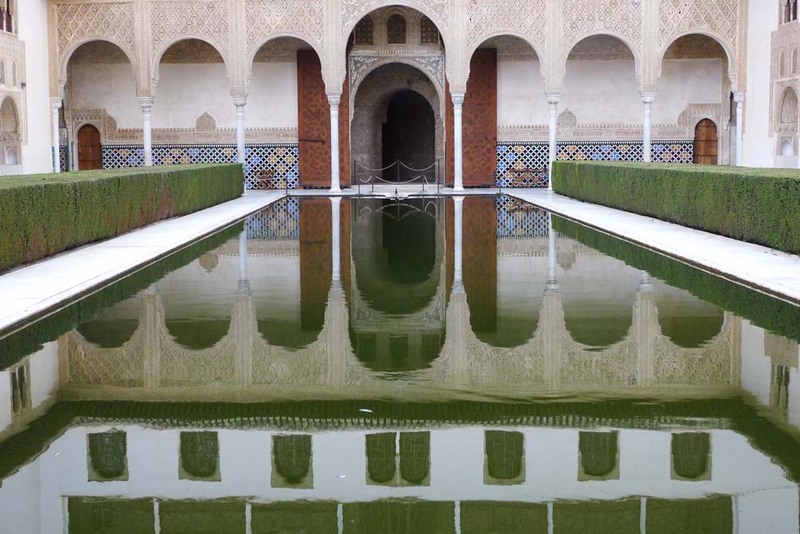 Waldemar is sure that Arab princesses once cavorted naked in these delicious pools. 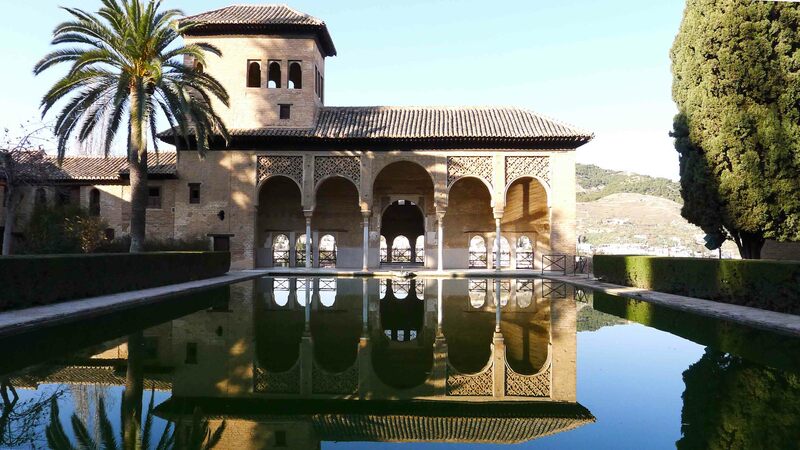 When buying your admittance ticket to the Alhambra, take care to observe the exact hour marked for visiting the main attraction, the Palace complex. Otherwise, a guard left over from the Franco era may prohibit you from entering his little empire. 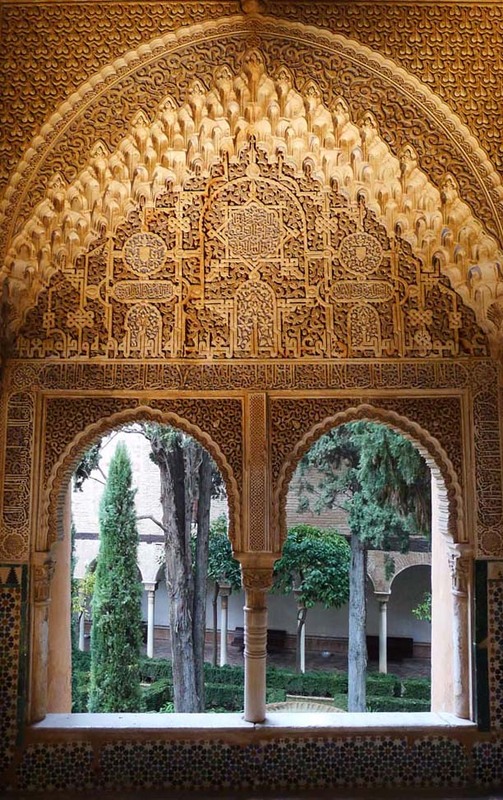 PATIO DE LOS LEONES. Main Courtyard of the Palace of the Lions where the famous fountain of the lions is swathed in tarps for the winter restoration. 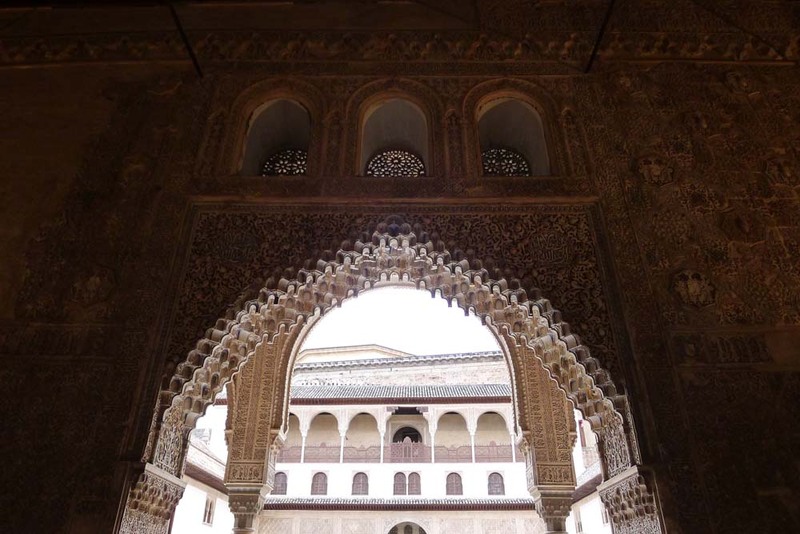 This part of the Palace was built between 1362 and 1391 AD, before unanimous approval for the earth-is-round theory. Los Leones was immortalized in 2011 as a Spanish two-euro commemorative coin – wonder if that Euro will last as long as the building. 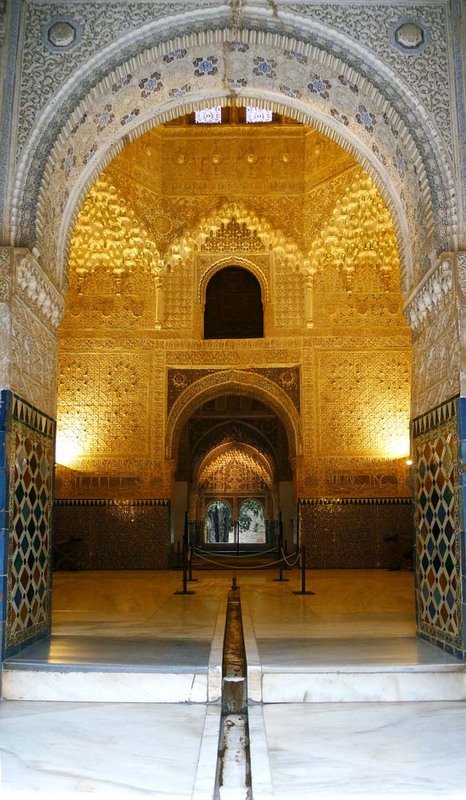 HALL OF THE ABENCERRAJES, refers to a dinner party where the Islamic host poisoned his guests, a rival tribe. SALA DE DOS HERMANAS, Room of the two Sisters. 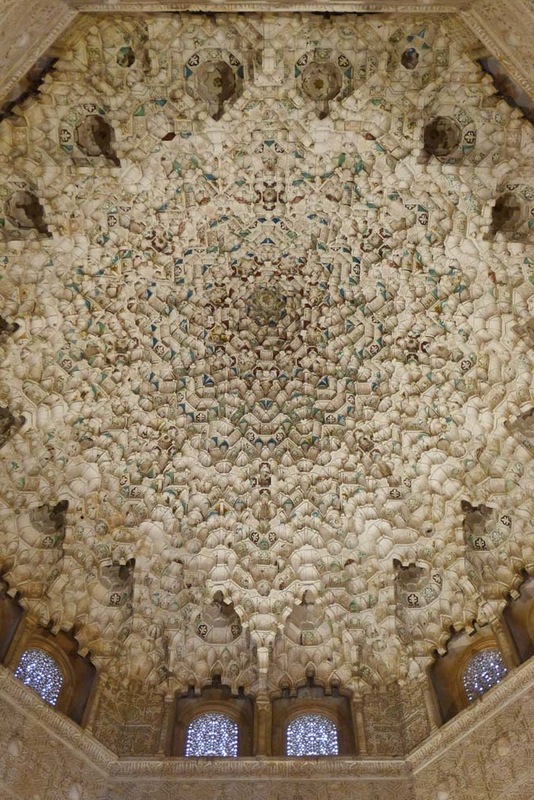 CEILING FROM SALA DE DOS HERMANAS. The Catholic reconquest of Spain forced the Moors to retreat further and further south. 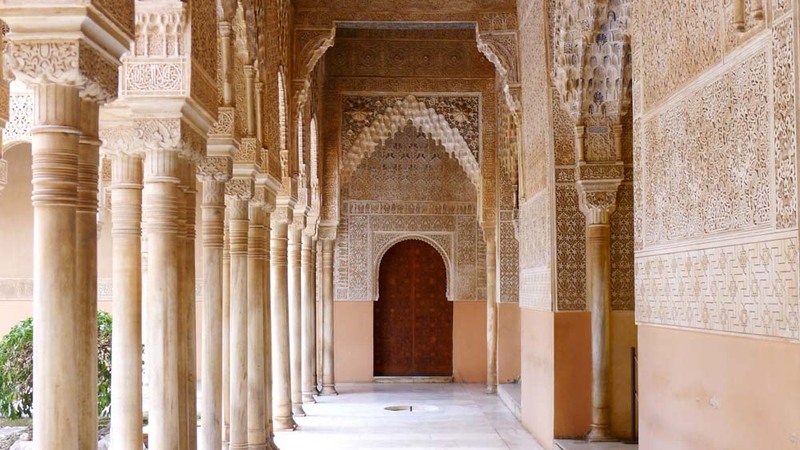 In 1492, while Columbus sailed the ocean blue, Sultan Muhammad XII of Granada capitulated this last Islamic territory to King Ferdinand and Queen Isabella who ascended to The Alhambra citadel decked out in flamboyant Arabic costumes. As the winners, they doled out 3/4 of the land to their royal buddies as thank you gifts and made sure everyone knew about the Inquisition. The losers retreated to Morocco where they really didn’t know anybody after 700 years. PALACIO DE CARLOS I encompassing the Museum of the Bellas Artes, the National Museum of the Hispanic-Islamic Art and the Hall of Temporary Exhibitions. Tragically, in 1526, King Carlos I of Spain (a.k.a. Charles V, Holy Roman Emperor, ruled 1519-1556), demolished part of the glorious Nasrid Palace complex to build himself this bull ring. To be fair, he never knew it was a bull ring. He set out to commission a huge rectilinear Renaissance palace with all the usual wretched royal excesses, but the architect died 25 years into the project (of exhaustion?). I’m not sure whose fault it was that the building still wasn’t finished after a century. Successive royals just weren’t interested in living down south in Granada. The vanity project was finally abandoned in 1616. 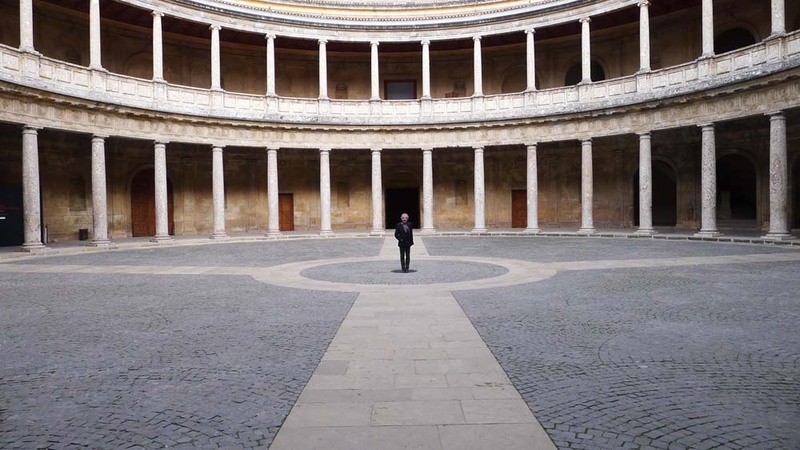 Its circular courtyard was used to violently end the lives of bulls. 200 years later, Napoleon’s French troops used the building to store gun powder and consequently, a few teeny, weeny, little accidental explosions wrecked even more of the Moorish architecture. Today, Carlos’ palace is home to three fine museums. 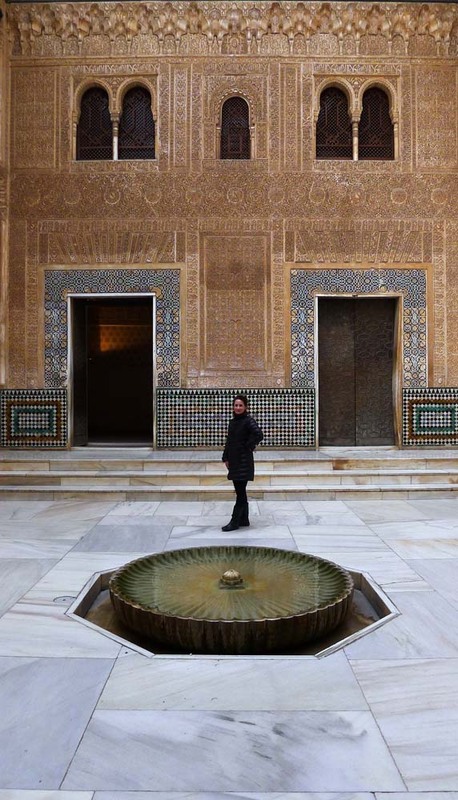 The exhibit we saw in January 2012 examined the link between the Alhambra’s centuries of abandonment and ruin, verses its revitalization as a fabulous tourist trap in the late 19th century. 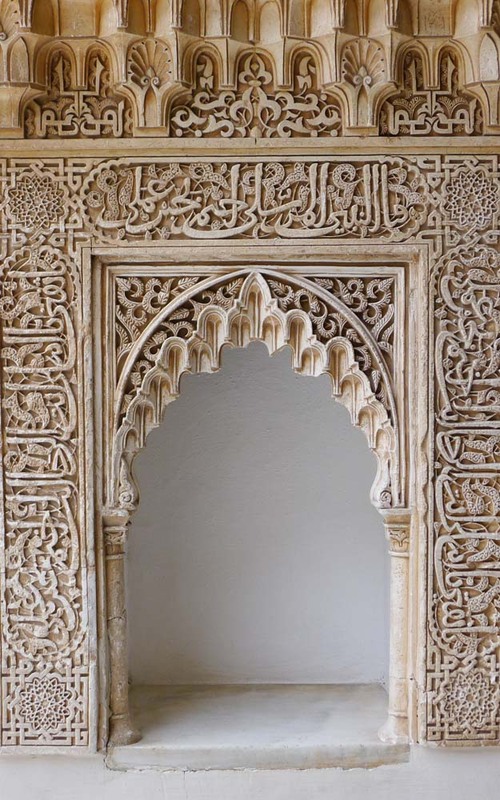 OWEN JONES (1809-1874, Welsh/English) the determinedly brilliant artist, architect, designer and author of The Grammar of Ornament lived at the Alhambra for 6 months in the early 1830’s. (As did Washington Irving, later). 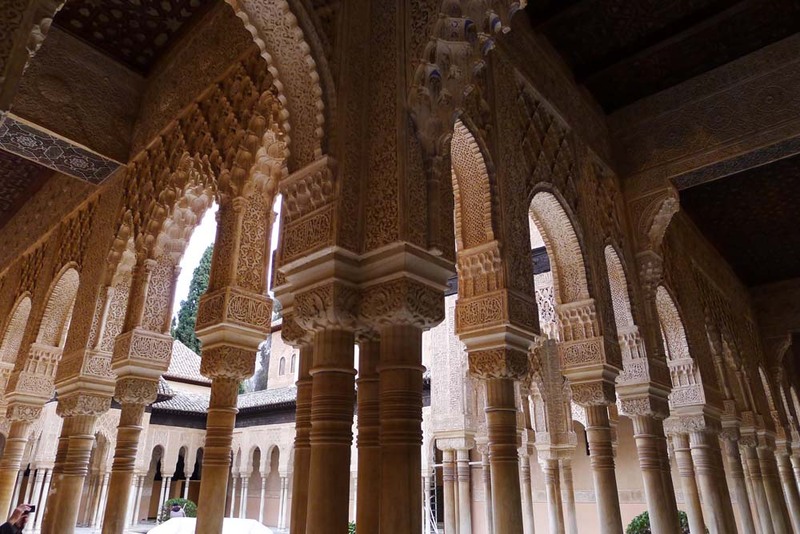 His detailed drawings and illustrations of the palaces were crucial to the restoration that began in 1862 (and will never end) and helped make the Alhambra one of the most glorious attractions in Spain today. My advice, move this one to the top of your queue!